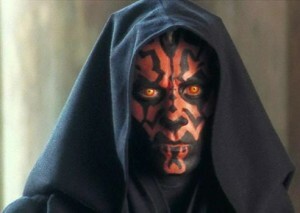 Darth Maul, while at a short glance seeming to be a simple, black costume, isn’t so very simple at all. 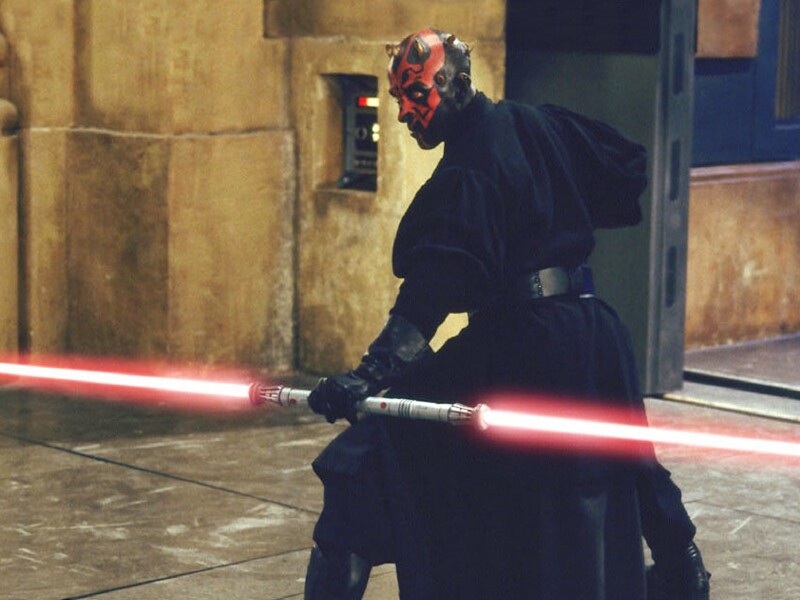 In fact, it’s pretty complicated; consisting of many layers – but the key factor to a screen accurate Darth Maul costume is the fabrics and colors – neither was there used just one fabric on the various parts, nor are the fabrics used just plain black. I met a member of the 501st – Thomas – who wasn’t exactly happy with his Darth Maul costume, which he acquired from “that big Asian reproduction company” (*cough* Costumebase *cough*). When I met him during a trooping wearing said costume, I could exactly tell why he wasn’t so happy. The overall shape was not bad (mind you, I’m not saying it was correct; but it wasn’t that bad either! ), but the worst thing was that the entire costume was made from the same fabric. As in: Undertunic, middle tunic, tabard etc. were ALL made from the same black fabric. 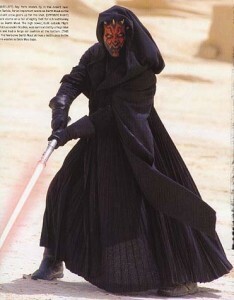 Which is plainly wrong for a good reproduction of this costume; and it’s far from being screen accurate. So I agreed to make him a way more screen accurate costume. This page serves as an analysis for the original costume and a walkthrough for my reproduction. 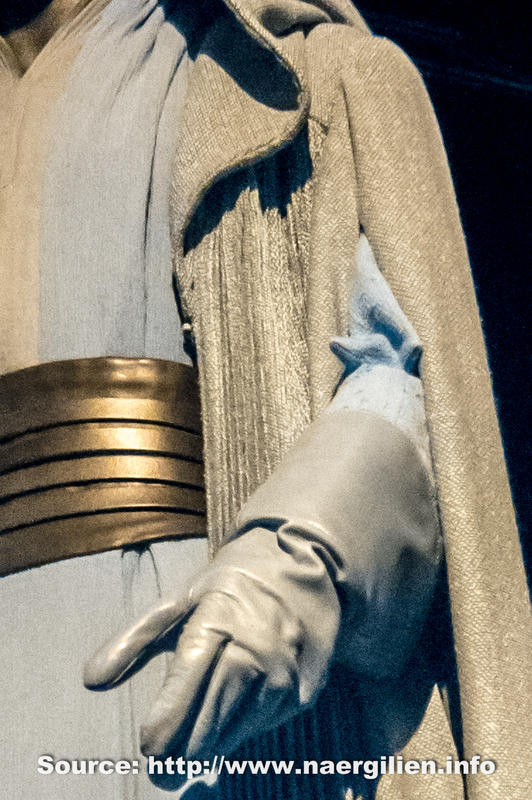 By now I can also scientifically back up the statement that many different fabrics were used on the original costume – please see my infrared photos from the Star Wars Identities exhibit (and the description of them, of course). You want to know why the costume isn’t just black, or why it’s not all the same fabric? Well, just read on and follow my analysis of the costume inside to outside. 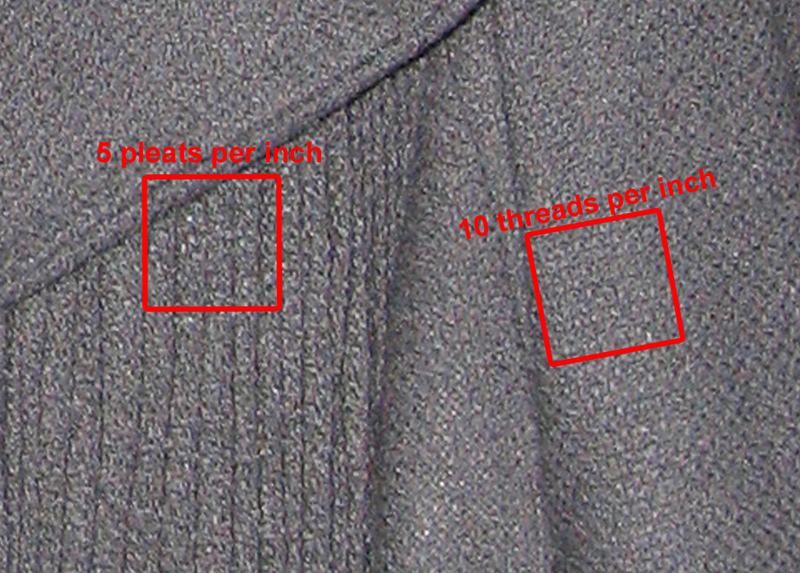 Alright, so this analysis is completely messed up compared to the actual order in which I created the reproduction – because actually I made the pants last, before the coat. 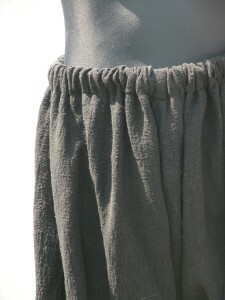 As you can probably see, the shape is that of Harem-style pants. with the inseam going down to almost the knees and very flared legs. The waist actually seems to be made up with a tunnel, into which either an elastic banding or a drawstring has been inserted. Not my personal choice when it comes to pant closures – I consider all kinds of tunnel closures “lazy” – but, well, that’s just the way it seems to be on the original costume. Now, if you would scroll down to the middle tunic, aka Sith Robe, you would already know the texture of this pants fabric – it’s very similar to the Sith Robe outer fabric. And here is another picture of the finished reproduction of those pants – as usual: Those DO sit weird and badly on the dress mannequin because a) that dress mannequin is several sizes smaller than the person I’m making this costume for and b) the dress mannequin “stands” on one single leg; making it practically impossible for pants to drape properly. It took 3 meters / 3.3 yards of fabric to make these pants. I will start with the one thing that’s closest to the body – the undertunic. However, the black undertunic is. 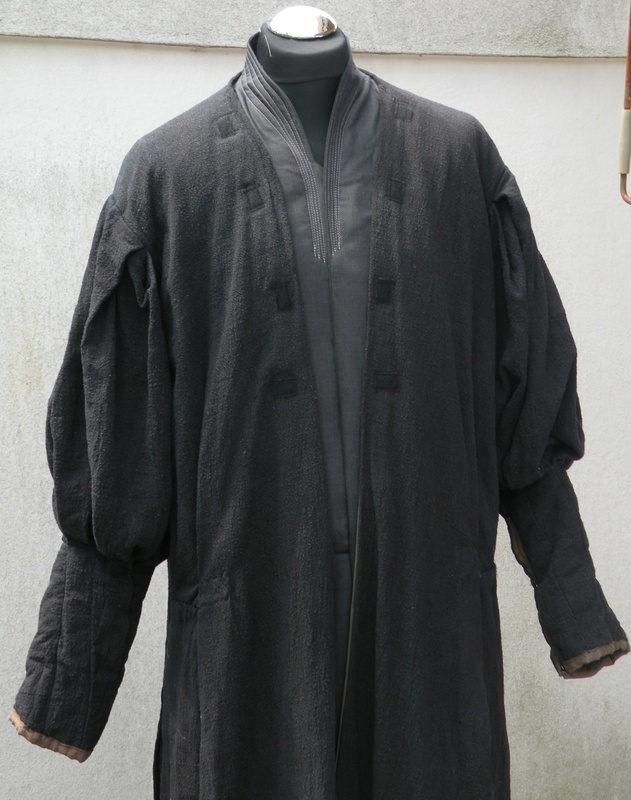 As you can see from the picture, the armholes are rather small; while the side split of the tunic is rather high – it goes up to approximately 4-6 inches below the armhole (instead of ending at the waist, as many people supect). 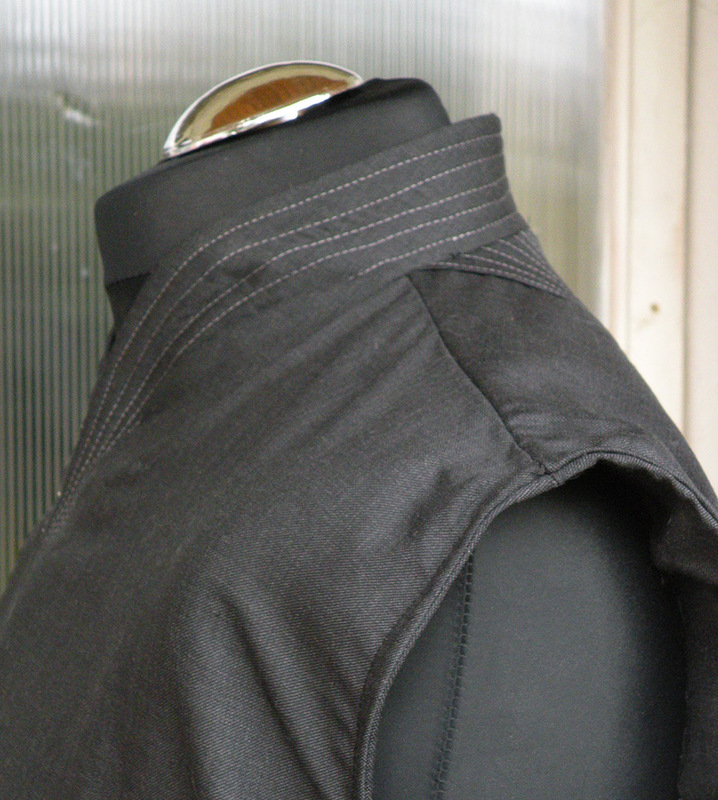 What you can also see is that the front of the tunic is split (see how the two front panels drape over the ‘mock bike’), while the back in fact isn’t split. This is NOT a light effect. As you can see on the floor, the light would come from the top right side; so the triangle can’t just be a lit area of fabric. Thomas, who I’m making this costume for, suspected that this may be the result of being a stunt costume – aka something to hide a harness under – but that would look different from my experience (with two rectangle holes in the back, opposed to a triangle shaped insert). What *I* suspect this to be is a triangular stitched area, stitched with the same kind of line embroidery that is used on the collar / front (to which I will get in a moment). Thomas immediately started tearing his hair and told me to forget the triangle because it will never be seen. That quilted-on triangle doesn’t really have any purpose. It’s just decorative; satisfying my obsession to simply HAVE that ‘lighter triangle’. 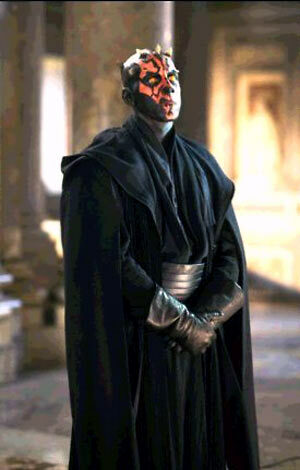 As I already said, it’s something that can never be seen when the costume is worn, since Darth Maul ALWAYS wears at least the middle tunic over the undertunic. The color is anthracite, with the stitching being a bit lighter. Also you can see a more ‘brownish’ area along the edge. The structure of the fabric is clearly a weave, but slightly fuzzy and mottled. This is an almost safe indication that this is a wool weave, since that would become slightly fuzzy when washed but retain the very slightly mottled coloring. Ignore the (crinkled) tabard and the (more coarse) coat for the moment; concentrate on the very center of the picture. 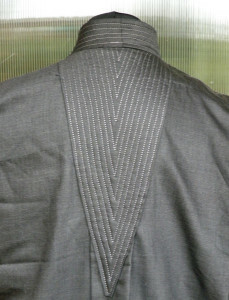 What you see are five lines of rather shiny (probably rayon embroidery thread) stitching along the collar, coming down to a point approximately 4 inches down the neck opening. Note that in said point, not all those stitched lines end at the same level – it’s rather random. The collar is a rolled collar by the way – just that it’s not rolled. This is basically the same kind of collar that Legolas’ and Elrond’s (Pre-Council) tunics feature. 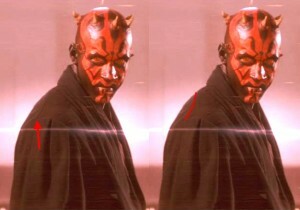 I will not spare you my admission that when I first cut the Darth Maul tunic, I made a HORRIBLE mistake concerning the cut of that collar, which I refuse to elaborate further. Let me put it this way; my horrible mistake forced me to first redo the collar line embroideries THREE TIMES, then to adjust the seam along the neckline TWICE. Just AFTER all that (and TEN HOURS OF CUSSING LATER!) I FINALLY noticed that I had simply CUT THE COLLAR WRONG – which resulted in me realizing that in effect, I had cut BOTH FRONT SIDES OF THE TUNIC WRONG. Since I realized that JUST A MOMENT AGO (and it’s 5:23 in the morning as I’m typing this – I CAN’T sleep if something is wrong until it is right! ), and know that I STILL have enough fabric to recut both front sides, I can now FINALLY go to bed. And sorry for shouting and venting, I’m just tired and frustrated for having lost almost an entire day on a stupid mistake; and my only excuse is that I haven’t drafted a shawl collar for approximately ten years and forgot how it works. Here’s what it should look like (after, as I said, redid the entire front…) compared to the original in the first picture. 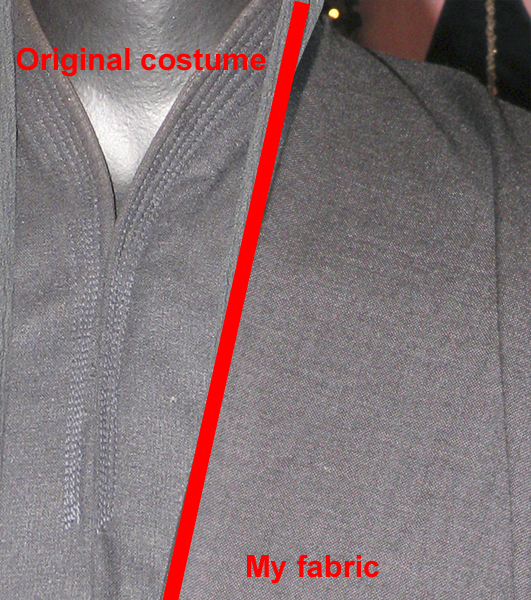 Here’s a comparing picture between the fabric that was originally used on the undertunic and the Italian suit weight wool fabric which I am using for the reproduction. I’ve photographed my fabric indoors with a flash; because that’s how the original costume was photographed, just to really be able to compare color as well as weave. Interesting enough, the color (brightness-wise) varies greatly between the approximately dozen photos I’ve made – we see the very same effect on the exhibit photos. For this comparison I’ve chosen the photo that turned out brightest. I could have chosen any other photo as well and could have compared it to a different exhibit photo; but this one showed the weave exceptionally well, so I picked it. The red arrows point to what looks like two hook and eye closures! Either that or those are sewn-on snaps of which we just see the very edge. At any rate, that is probably how the entire front of the tunic closes (to approximately waist level where the front split would open, as shown in the last picture). 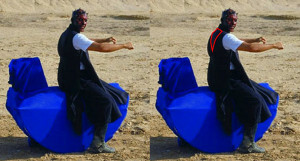 As you could see in the first picture (Maul sitting on the mock bike), the undertunic goes to approximately mid calf. However, he is SITTING in that picture; so the actual length is shorter (because if he would be standing, the angle would change). I found one picture that shows the approximate length when standing. As you can see (on the knee that’s below the hand holding the double light saber), the undertunic actually is just a bit longer than knee-length. 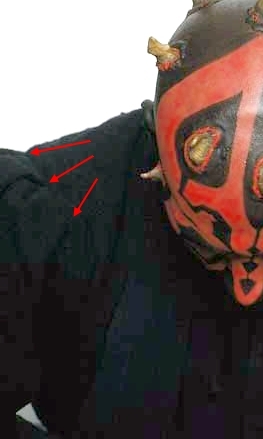 My Darth Maul undertunic reproduction takes up 6.5 meters / 7 yards of material – 3 meters of the Italian suit-weight wool, another 3 meters of fine silk habotai lining, and half a meter of stabilizer for collar and armholes. 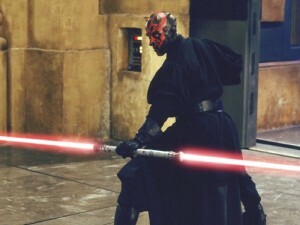 Over the sleeveless undertunic, Darth Maul is wearing what the 501st calls the ‘Sith Robe’ in their standards. I prefer to call it the ‘middle tunic’ (just to clarify the terms I will be using in this analysis). Now, if you were thinking that this is either crinkle cotton or linen, you’re wrong. 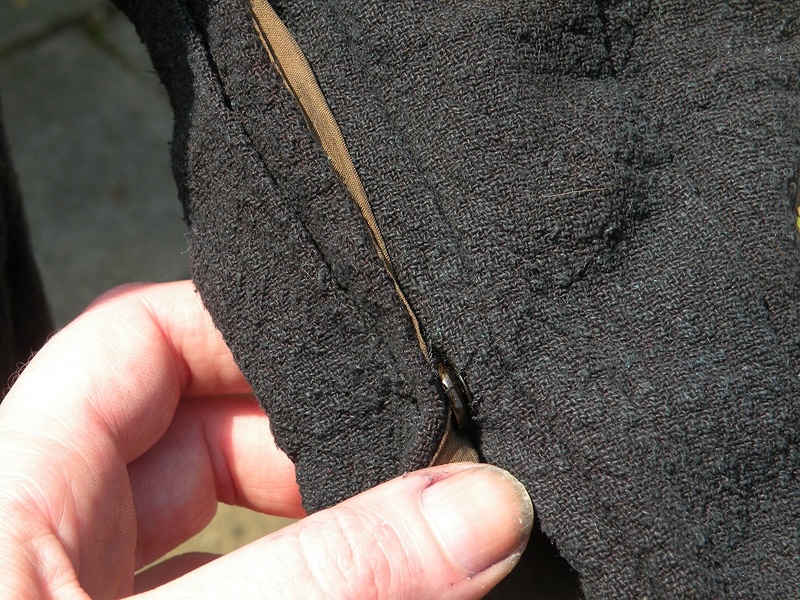 This photo shows a heavy, loose weave silk noil which was boiled and, in reaction to that, crinkled. It’s almost impossible to find silk in that weave / weight any more – Aurora Silks has a similar weave, but it’s not exactly the same. 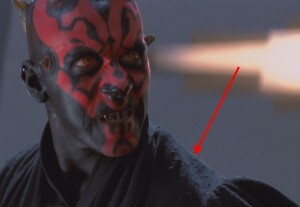 That aside, said picture from the movie shows another very interesting detail. Please click and look at it closely. The middle tunic has NO SHOULDER SEAM. Which basically means that the front side pattern piece and part of the upper back are cut as one piece, then joined at the center back. 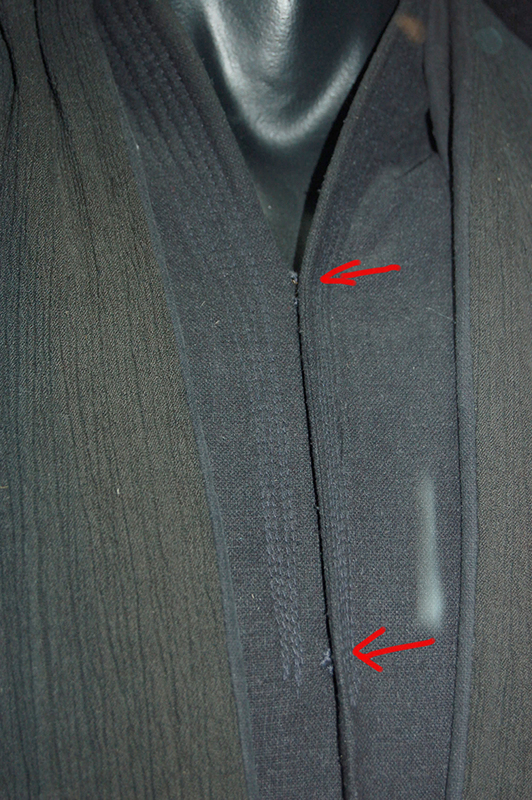 It was brought to my attention that some very “clever” people thought that there was a shoulder seam anyway – Uhm, no. That isn’t a shoulder seam. 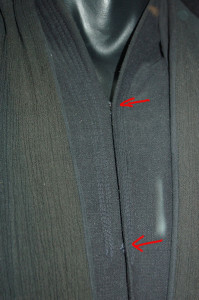 A shoulder seam would go from the center top of the shoulder (where the center sleeve pleat is in this picture…) towards the side of the neck. b) it also doesn’t go to the side neck, but to the center back. That’s why this isn’t a shoulder seam. I first thought it may be a quilted down line, but I was wrong (and still need to tell Thomas about that 😉 ). Look at the last picture again. WHERE is that alleged “shoulder seam”? – Right – it’s BETWEEN the center- and back pleat on the sleeve. Correct? Now just read on and look at the NEXT picture. 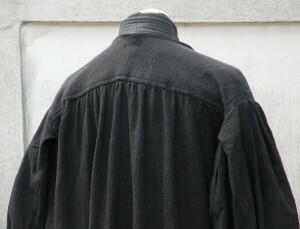 Where is that separation seam of the upper back part positioned, compared to the sleeve pleats…? (And BTW – if you think you found errors in my examination of the original costume, it would be awfully nice if you could tell me (I really mean *me*) about your findings. Personally I find it totally childish to write something like “whoohooo I finally found something she did wrong!! !” (not exactly the wording that was used, but you get the point…) on a forum that I can’t even access, let alone by people who don’t sacrifice their time and webspace to provide an in-depth analysis about how the costume was constructed… like me…. …but then again it also totally contributes to my personal amusement to find out that your alleged findings are wrong because apparently you can’t count sleeve pleats (or determine the position of a seam between them, that is) 😉 ). 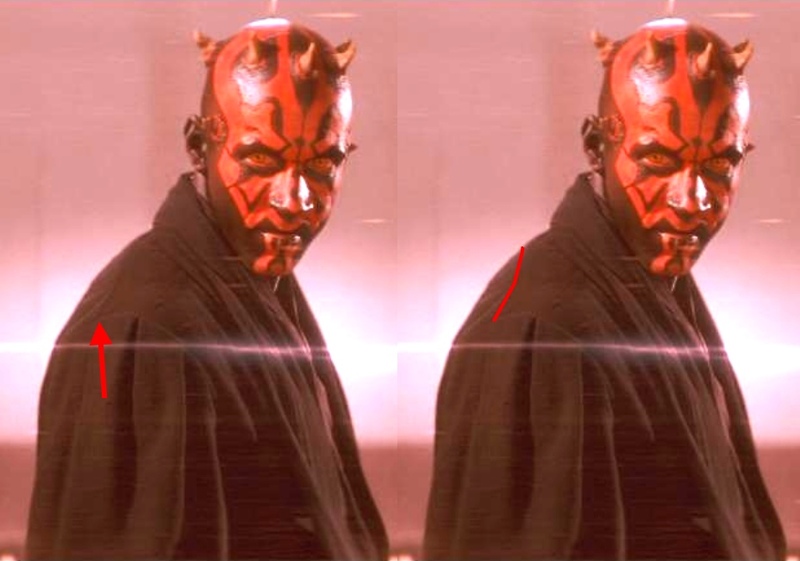 You can see that upper back part being separated from the lower back part by the aforementioned seam much better in this picture – left: original: right: red line indicates the seam. I don’t know why that ‘separation seam’ on the back seems ‘higher’ in the first picture and ‘lower down’ in the second picture – different tunics maybe? Stunt tunic? Weird body pose? No idea. But from the placement of the seam between the pleats on the sleeve, it must be the very same seam. If you REALLY have sharp eyes, you’ll notice a tiny velcro patch at the base of the neck. The counterpiece is sewn to the shawl tabard, to keep it in place (but STILL keep it detachable!). 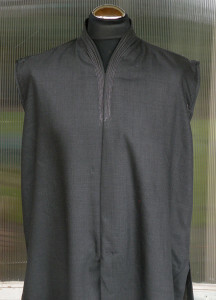 The upper parts of the sleeves are pleated. 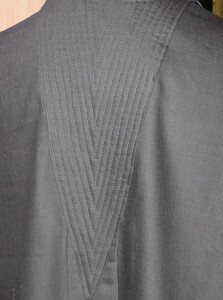 There are six pleats of which two are ‘facing each other’, resulting in three deep pleats on each sleeve. The lower part of the sleeve (the underarm) is also pleated, but those pleats (six around the arm, as far as I could count) are sewn into place. That’s why the lower sleeve is tight while the upper sleeve is bloused. Here’s how I constructed my sleeve – and yes, from shoulder to wrist, that is indeed one single piece of fabric; pleated into the armscye at the outer shoulder with the six contering pleats, and again all over the underarm with six pleats. 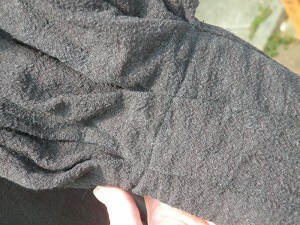 The underarm sleeve closes with three black snaps. Note that I did indeed have to edit some of my pictures – as in: lighten them – because otherwise you wouldn’t have been able to see anything, black on black. 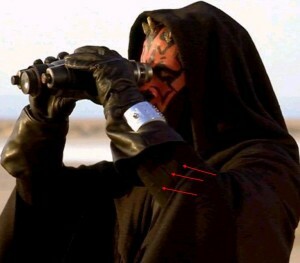 The length of the tunic is indicated by a blue arrow in the m following picture – it ends approximately between the knee and mid calf. 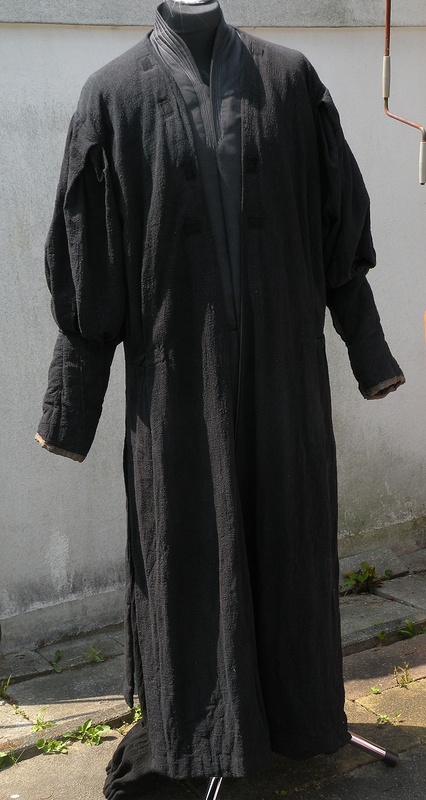 I used 6 meters / 6.6 yards of the outer material, 6 meters / 6.6 yards of silk noil as interlining and another 5.5 meters / 6 yards (less than the other materials because the lining sleeves are more narrow than the outer sleeves) of habotai silk for the Sith Robe. So all together, what you’re seeing on my reproduction Sith robe is 17.5 meters / 19.2 yards of fabric. I am deliberately not talking about the plural, which would be ‘tabards’ (and what the Jedi have). 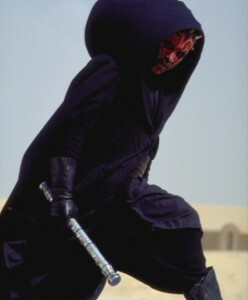 Darth Maul is wearing a single tabard, draped around the back of the neck like a shawl – which is why I named it the “shawl tabard”. 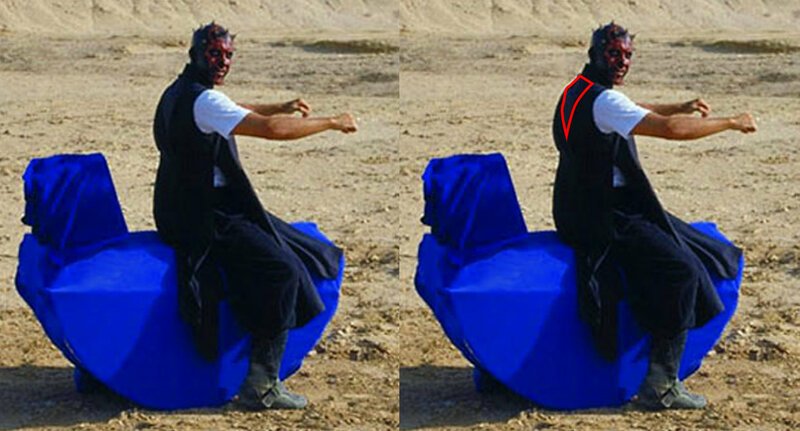 …looking at it from the front, the length-wise crinkled shawl tabard becomes very obvious (ignore the red arrows; that’s the same image as the ‘untertunic front closure’ image from above). What you can also see in this picture (and very well so!) is the non-crinkled lining of the shawl tabard, which you can clearly see on the edge of the tabard at both sides – it’s slightly more black (and less brownish) than the shawl tabard. 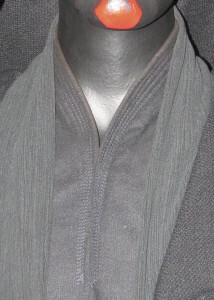 An infrared photo of the original sunray-pleated coat, showing the texture / weave of the coat material. See more infrared- and color photos of the original costume on my Star Wars Identities photos page. 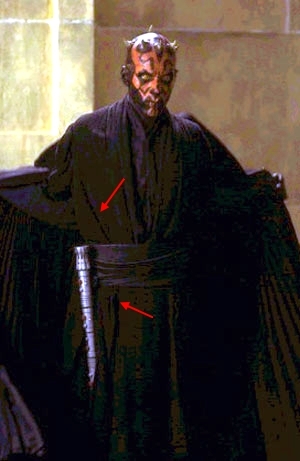 Darth Maul’s coat has some very interesting features; besides something that strongly resembles Elizabethan hanging sleeves (I’ll explain that later) it also features full, sewn-in sunray pleating from approximately chest level down. Let’s start with the fabric first. The fabric is a really, really coarse linen. Let me show you how coarse that is by using my ‘proportional method’. The actor, Ray Park, is said to be 5ft 9in (175 cm) tall (which isn’t exactly tall for a man, but that, too, is something I will get back to later). Let’s have a look at that using a measurement tape. As you can see, I’ve adjusted the height of this exhibit picture to fit a height of 175cm (1 inch = 2.54cm). Since that picture is now too blurry to actually see threads, I’ll overlay it with a larger closeup; lining up the head and belt, aided by a lower opacity of the closeup layer. From there I can zoom in REALLY close, and actually see not just the thread count but also the size of the pleating on top. The following picture shows two squares, each being 1 inch x 1 inch large. As you can see, the thread count is approximately 10 threads per inch. That’s 10 threads per 2.54cm, making each thre4ad approximately 2.5mm thick. That IS coarse! 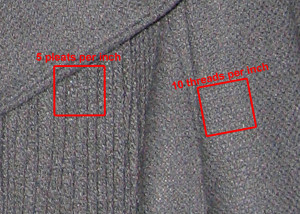 The pleats, on top, are 5 per inch; that’s approximately 0.5cm for each pleat. 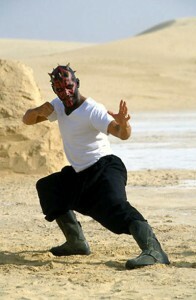 However, as I already said, Ray Park is considerably small for a man. Thomas, who I’m reproducing this costume for, is considerably taller. As in: approximately 195cm (6ft 4in) tall. Now, if the original actor is 175cm tall, that’s 100%. If the person I’m reproducing this for is 195cm tall, that’s ~111.5% compared to Ray Park’s height. Which means that the thread thickness I need isn’t 2.5mm but closer to 2.8mm. And the pleating on top doesn’t have to be 5mm but almost 5.6mm. The difference MAY seem small, but it’s important to keep in mind to create a screen-accurate reproduction. I’ve found a considerably coarse and heavy tussah silk, which will work perfect for this reproduction. 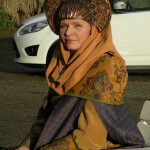 The shaping of the hood is interesting too – basically, each pattern piece (the hood is sewn from two pieces which are joined at the center, on top of the head) roughly resembles a half circle. The person I’m making this for compared the shaping to a windsock. 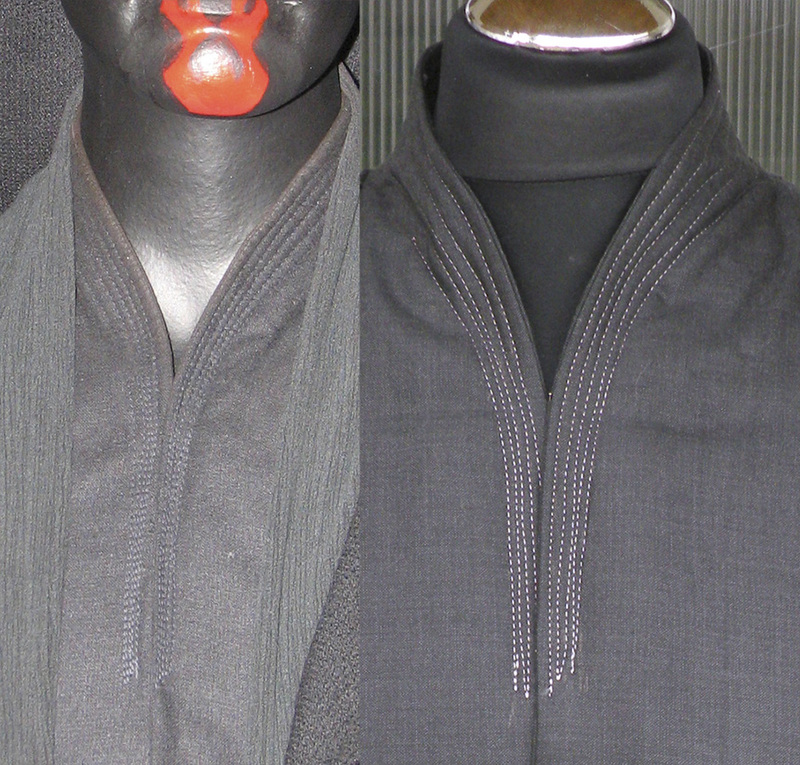 Also, unlike the hoods on many Jedi robes, this hood isn’t gathered to fit the neckline. Then, of course, there’s the pleats on the cloak. 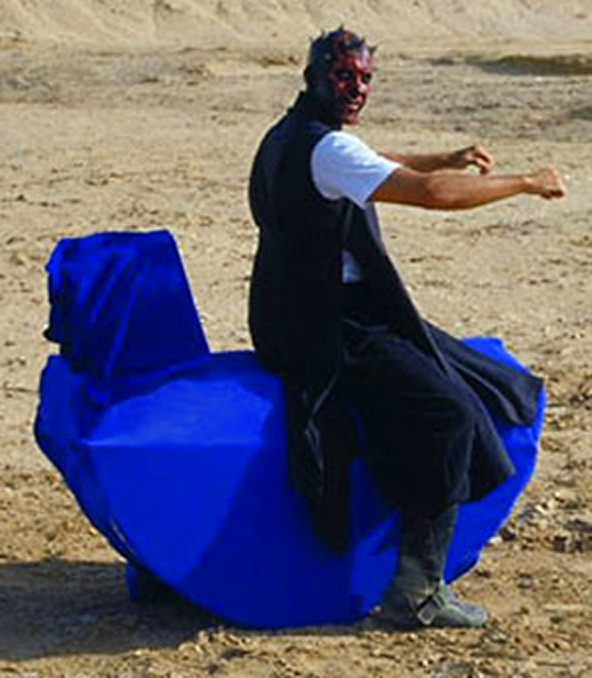 The standards of the 501st assume that they’re not sewn in… but I know better from just looking at a picture. Look at the center front bottom of the picture. First, the fabric, against the bright sand, is slightly see-through; which is rather normal for coarse linen or silk fabrics, since the threads that the fabric is woven from are thick, but not close to each other. The other thing however is even more interesting: You see the lines of the pleating. For what I am going to explain now, I need you to experiment with a fabric that has a similar appearance (being slightly see-through when held against the light). Take that piece of fabric, which is preferrably made from natural fibers like silk, cotton or linen, and iron pleats into it. As in, like so: /\/\/\. Now stretch the fabric back out (because that is what we see in the image above), hold it up against the light and see through it again. I will tell you what you will NOT see: Lines. However… if you put in a seam along each ‘folded edge’ of the pleats, just 2mm / 1/16 inch away from the folded edge, and THEN hold it up to the light… you will see lines. Let me use other words: It’s impossible to see the lines of the pleating, which can clearly be seen in the image above, without basically “setting” each pleat on each fold with a seam *very* close to the edge of the folded-over edge. As you can hopefully see, you can see (or rather: pretty well guess) the center back, as well as all the folded-over layers to the right side front. And that’s how I counted the pleats – and came up with fifty per side, or one hundred for the entire coat. Note that “one hundred” means: 100 times this: /\, not just / or \ of the pleat. Which, on the other hand, means: 200 seams. I crashed to my keyboard and cried bitterly when I realized that, lol. Unfortunately I did not exactly take photos while making the coat. In fact, I think I only have two photos, where I laid the coat body out on the lawn outside to make it “more black” by using black silk paint; since the thick fabric didn’t take regular dye so well. 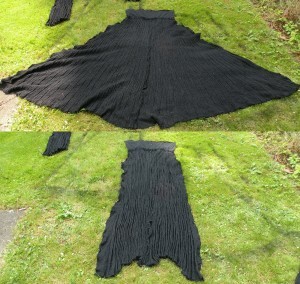 And since the coat is HUGE, the lawn in the garden was the only large enough surface to do so. 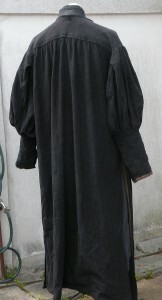 The upper part of the photo shows the cloak’s backside “spread out”, the lower part of the photo shows what it looks like when it just hangs down. Never mind the unevenness of the hem; that problem was solved later. I didn’t quite manage to do 100 pleats and sew 200 seams. That’s because even though I had 14 yards of fabric (! 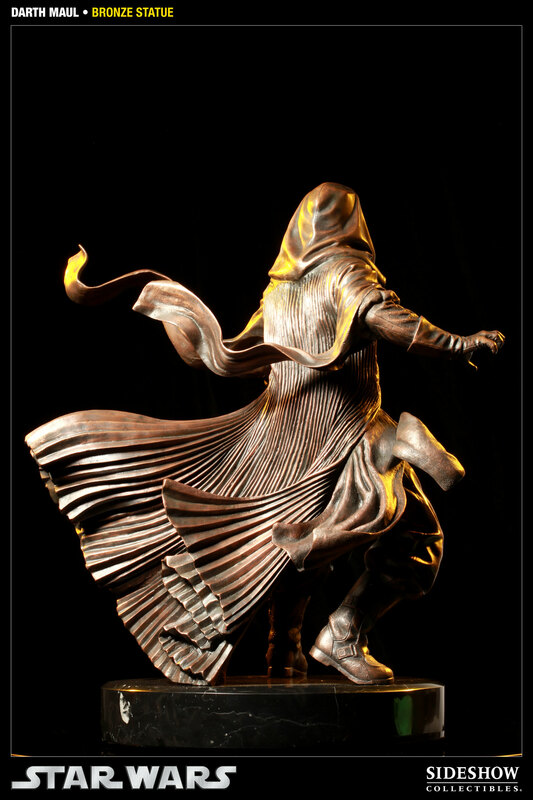 ), that amount STILL wasn’t enough to capture the actual width of the coat. So my version of the coat “just” has 180 seams, or 90 opposed to 100 pleats. Unless you would really start to kneel down and count them, though, I don’t think the 10% difference in pleats makes very much of a difference, lol. 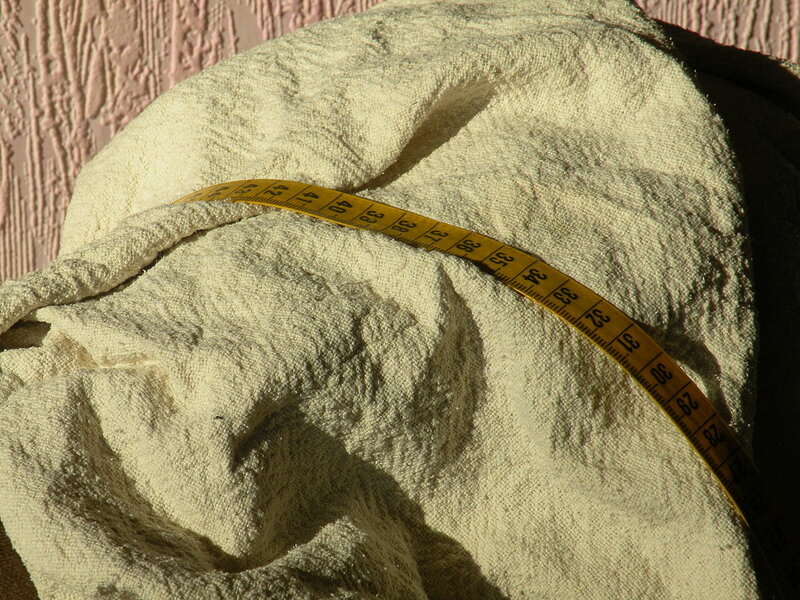 The entire costume took up over 45 meters (or 50 yards) of fabric; of which I barely have any scraps left. No kidding. I am desperately trying to find a good clear picture & description of the Darth Maul belt, as I have been asked to make one for the costume. Hmmm, the belt is really simple – one large piece of reinforced leather (basically an Obi) with several strips of leather over it. But if you take commissions, you should know by just looking at it what to use (as it’s so very simple); shouldn’t you? I love the detail you put on the project and the way you show clues on how to find the perfect material. Amazing, really amazing! Greetings and love from Munich! There are no patterns for this to be found – do you make your patterns available? Besides – and this is just a neutral comment on your request, really – do you go into a restaurant to ask the chef for the recipe of one of the meals….? That’s basically the same as asking an artisan like me for a pattern. Great page! If you were to sell this custome what would you price be? One you are already seeing on this page, the other one will be for my son when he’s grown up. If I WOULD make another reproduction (which I really won’t!) the price would be a four figure amount, and the first number would definitely not be a one or two. Just think of the fact that there are over 50 yards of fabric, much of it being silk in various weaves, and almost three months of work in this costume – that will help you to understand that kind of pricing better.